The recent corruption cases in government are costing President Uhuru Kenyatta support, especially from his Central and Rift Valley strongholds according to a new poll by Infotrak. The poll shows that the highest number of Kenyans concerned about corruption hail from Central and Rift Valley, the two regions that overwhelmingly voted for Uhuru and William Ruto in 2013. 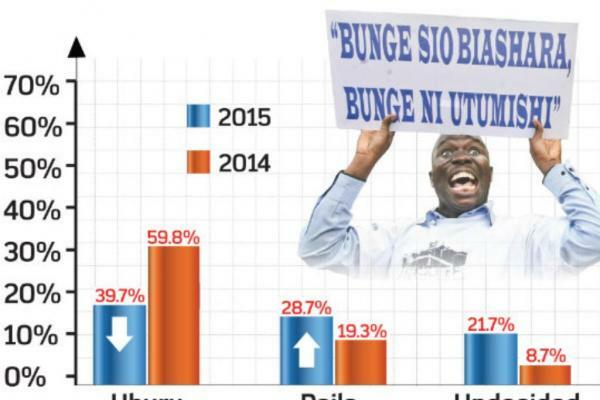 The poll shows Uhuru’s approval rating has dropped from 59.8 per cent in November 2014, to 33.7 per cent last week. The survey indicates Cord leader Raila Odinga's popularity rose from 19.3 per cent to 28.7 per cent in the last one year. Kenyans still view the two as the main contenders for the Presidency, with Peter Kenneth coming third with 5.7 per cent. Kenneth has maintained a low political profile since the last elections. Fourth in popularity is Wiper leader Kalonzo Musyoka with 2.5, Martha Karua 2.2, William Ruto 1.6, Moses Wetang’ula 1.4 and Musalia Mudavadi 1.2. Many of Uhuru's supporters now appear undecided, with this number rising from 8.7 per cent in November last year to 21.7 per cent this year. The poll was conducted and sponsored by Infotrak Research and Consulting between November 6 and 9. A sample of 1,000 respondents was interviewed to represent the Kenyan adult population of 19,462,358, translating into a minimum margin of error of -/+ 3.1, with a 95 percent degree of confidence. The survey was conducted in 25 counties in all the former 8 provincial regions of Kenya.